Aloof from the hustle and bustle of the office going crowds, an impressive building stands on Janpath (People’s way) in New Delhi. Frequented mostly by the foreign tourists and school children on day excursions arranged by their schools, this impressive building, exhibits some of the rarest archeological gems from ancient India and China. Out of the large collection of antiques in possession of the National Museum, three categories of antiques are the most impressive. The stone carvings of the ancient India, Indus valley civilization relics and lastly the Sir Aurel Stein collection from Taklamakan and other desert areas of China, are perhaps some of the the most unique and exquisite remnants from a long gone by and ancient era. 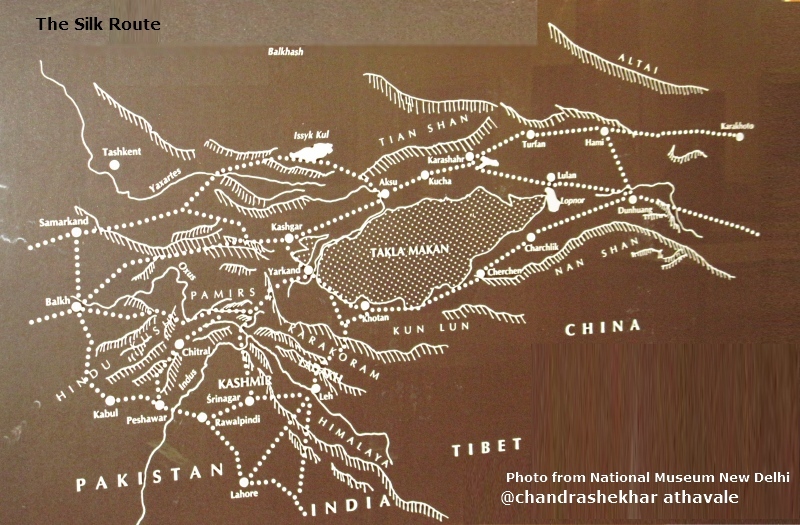 These aptly demonstrate the richness of culture and history of the Indian sub continent and also it’s effect on the famous silk route from China to India and to the west. 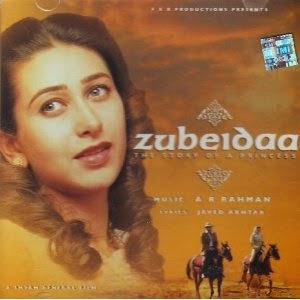 In this serial, I would be trying to recapture some of the history and the glamour from this ancient past. Luckily for me, National Museum allows to take photographs of the exhibits. I was thus able to take snaps of the exhibits that impressed me most. We begin our tour with the ‘Aurel Stein collections’ from Chinese Turkmenistan or today’s Xinjiang..
Sir Aurel Stein, the foremost, amongst the archaeological explorers of the early 20th century, led three major expeditions to Chinese Turkmenistan (Presently known as Xinjiang) and western chinese areas around the great deserts of ‘Takala Makan’, ‘Lop-Nor’ and ‘Gobi’, during 1900-01, 1906-08 and 1913-16 . His expeditions were financed and supported by Government of India. Sir Aurel Stein was born in Budapest, Hungary and was the youngest son of his parents. His brother, who was much elder to him, and his maternal uncle, groomed him and influenced his education so as to prepare him for a scholarly career in a university. He however, opted for a job in British India. Right from his childhood, he had a fascination for Central Asia and wanted to travel in the footsteps of ‘Alexander the Great’. 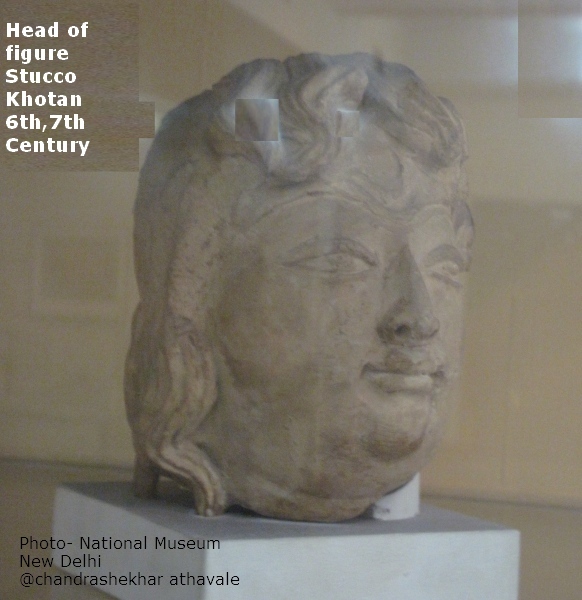 His job in India introduced him to ancient Indian culture and he became interested in ‘Gandhar’ influence on early Buddhist culture. He felt that this ancient culture must have influenced the ancient silk route towns in China. During his expeditions,which were organized almost single handedly by him, he discovered large number of objects, artifacts, silk banners- books, Stuccos and Frescos from a wide area on the rim of these great deserts. His name became almost legendary in his times.In all Stein marched some 25000 miles across Central Asia, often in appalling conditions. He was festooned with international Honours, but to the Chinese, he was an imperialist villain who systematically robbed them of their history. 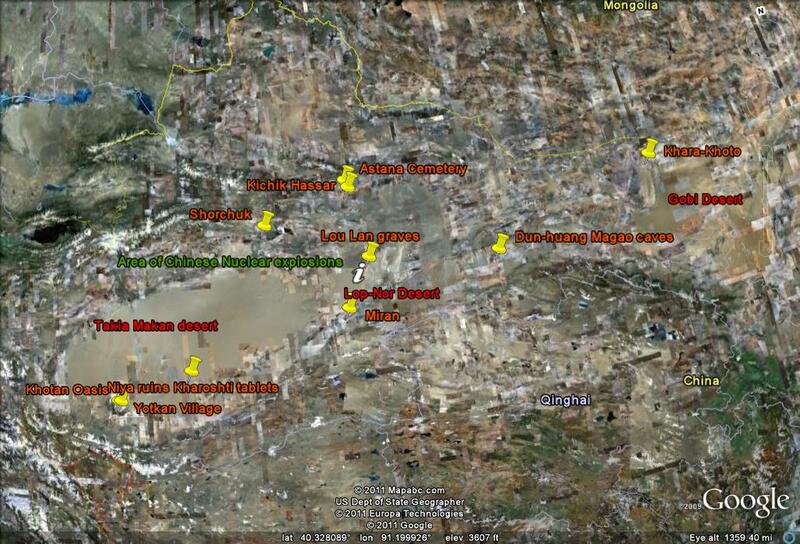 The places in China, from where Aurel Stein collected the antiques, is shown with yellow markers in this Google Earth image. 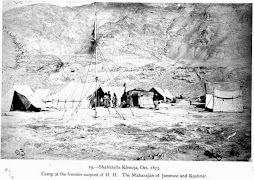 In all the three expeditions, one place which Sir Aurel Stein made a point to visit, was Khotan, a desert oasis, located on south west side of the great Taklamakan desert. 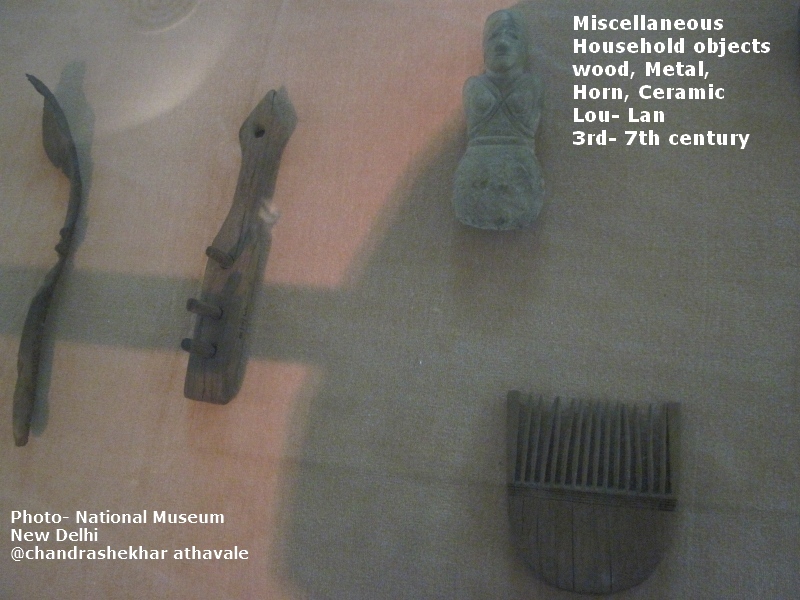 In each of these visits, he found a wealth of terracotta and wooden figurines and objects. A small village called ‘Yotkan’ lies few Kilometers north-west of Khotan. Stein discovered many antiques here in a pit, which as Stein found out, was an abandoned gold mine famous for gold dust. 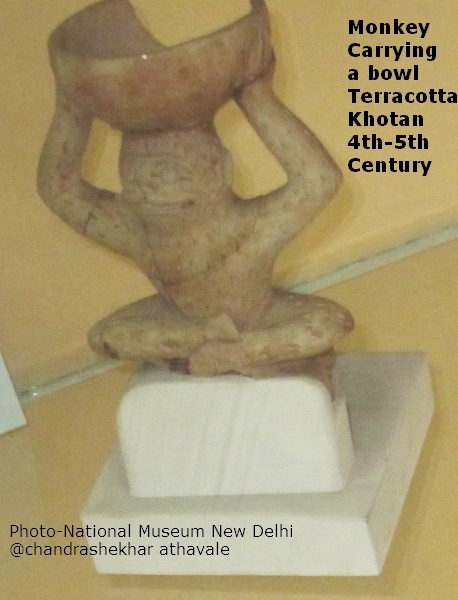 At the New Delhi Museum, I found at least five beautiful exhibits from Khotan and Yotkan (a small village few KM away from Khotan.) area. Stein describes this as “Terra-cotta bottle, shaped like pilgrim bottle, with short expanding neck and mouth, small handles tucked under spreading lip, flat base. Each side decorated with fully open lotus occupying whole surface ; two rows of petals with grotesque human head in centre. Bands of herring-bone pattern divide two sides. Surface coated with rich red glossy slip resembling quality of Samian ware. The grotesque is applied and has no slip over it. Very good work. 6” x 4- 3/4” x 3-3/8”. 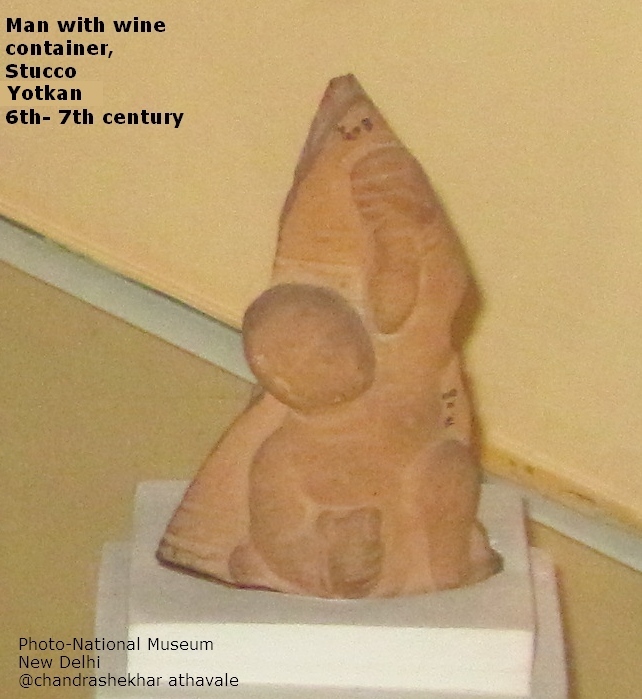 This bottle was procured by Stein from Yotkan gold mine area. Stein describes this terracotta fragment as “.showing a Bacchic(intentionally shocking) figure applique, of unmistakable Gandhara type, with wine-skin and rhyton (Vessel for drinking or pouring a drink) ; the handles with fine palmette(spread like a palm leaf) ornaments, Fresco of neck of terracotta vessel, with Bacchic figure appliqué. Pose of figure suggests atlas-like supporters found in Gandhara friezes (A decorative horizontal band). Seated on ground the figure has left foot planted with lower leg vertical ; right leg missing but probably bent and resting flat ; side of knee and ankle touching ground. Body inclined to right. Head , turned slightly upward towards long pendent object held up at arms length in left hand. Right hand at right side, grasps mouth of wine-skin. Upraised object probable a form of rhyton. 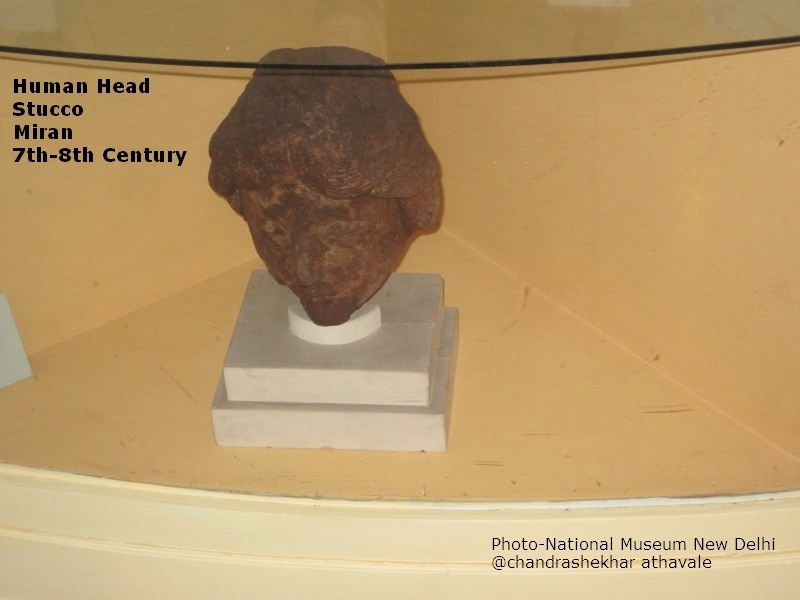 Head of child. Bracelets, and a mark at neck, perhaps necklet, or edge of tunic. Head slightly weathered. 3-5/8″ X 2-1/8”. This item also obtained from Yotkan. 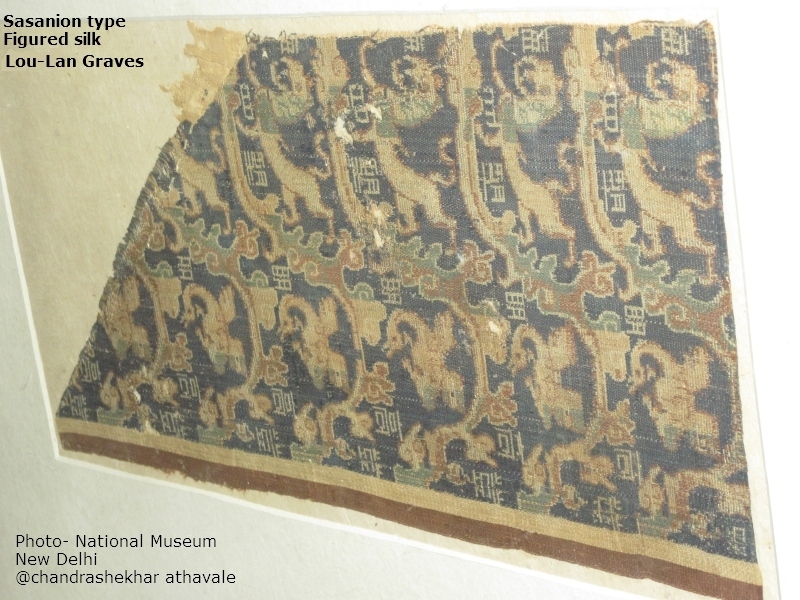 Next three exhibits are from collection of antiques by Mr. C. Hardinge, late British Vice-Consul at Kashgar in Xinjiang, acquired from one Badruddin Khan and generously presented by him to the museum in 1923. Described by Stein as “ Stucco relief fresco, burnt. 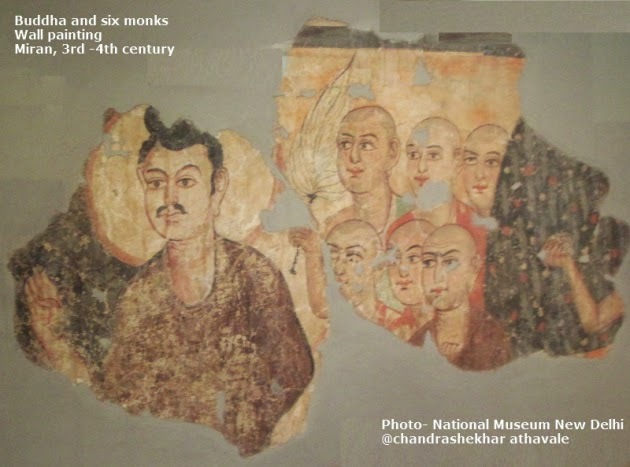 Fresco of Gandhara figure. Legs and forearms broken away. Traces of pink paint. 4-1/2” x 3-1/2″. During his first expedition in 1900, Stein came across the first of the two most important archeological finds made by him. He was investigating along bed of Niya river on the south west corner of Taklamakan desert. Here, he came across a ruin of a township, which had flourished during Silk route centuries. 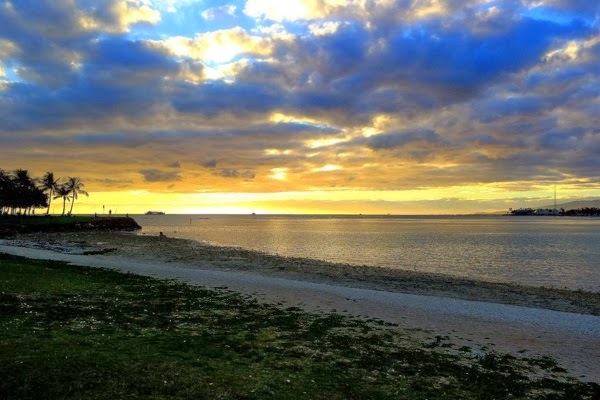 In this town, which was named by Stein as Niya ruins, he found in a rubbish heap, more than 200 numbers of inscribed wooden tablets of various shapes and sizes(mainly flat or wedge shape). Some of the tablets were single and some were found as pairs, tied to each other by rope. 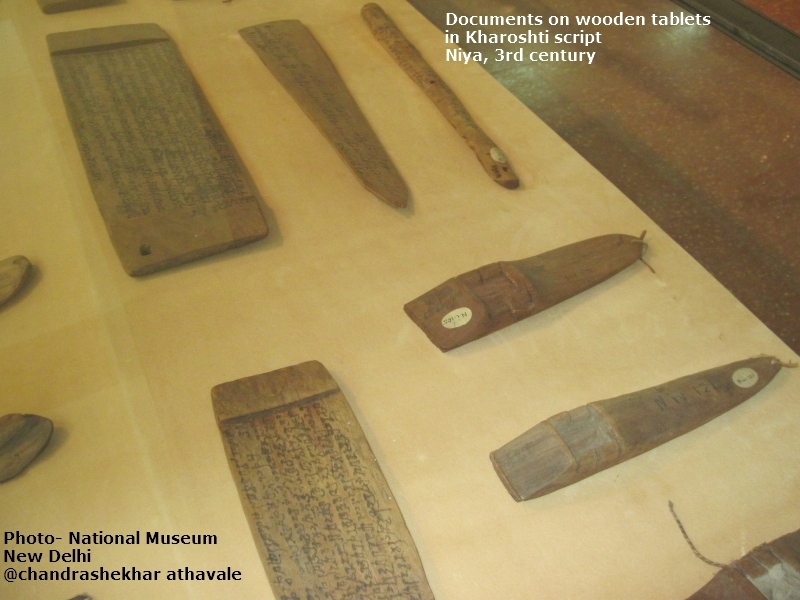 Most of the wooden tablets were inscribed with writing in an ancient Indian script known as Kharoshti script. 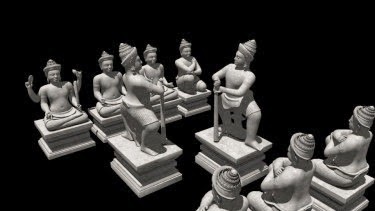 The language used was early Prakrit. 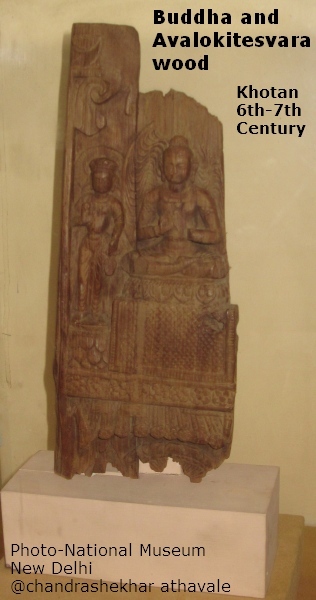 Most of the wooden documents are dated from early second or third century and contain official correspondence and records of various kinds, such as reports and orders to local officials on matters of administration and police, complaints, summonses, directions for the supply of transport, &c., to persons traveling on public business. Stein visited the Niya ruins subsequently in his second as well as third expeditions and came across even more number of such inscribed wooden tablets. Chinese traveler Xuanzang had claimed in his travelogues, that this region was conquered by Indians around 200 BCE and was ruled by them. Stein was able to find direct evidence at Niya, in form of wooden tablets, to support Xuanzang’s claims. During his second expedition in 1907, moving along the southern rim of Takla Makan desert, Stein started excavations in an old Tibetan fort at Miran. About a mile west-north west of the ruined fort, Stein found a cluster of five ruined mounds. Curious appearance of one of the mounds with a well preserved dome, had Stein’s attention. This ruin turned out to be a Stupa with coloured Fresco panels all around, now in damaged condition. This particular fresco panel was found by Stein, lying on the ground and saved miraculously from destruction. Stein describes this Fresco panel in great detail as “ Fresco panel (incomplete) fallen in front of another Fresco panel. On left, is upper half of a Buddha, right hand raised as in abhaya-mudra, but with thumb bent inwards touching second joint of third finger (eighth on hand). Dr. Venis suggests that this may symbolize Buddha expounding ‘the eight-fold way’ or the eight Päramitas. Left hand low, probably gathering up drapery. Behind him are six disciples, in two rows of three. one above the other ; the nearest to him in upper row holding a yak-tail fan in raised right hand ; to right again of disciples, appears naked right arm, which grasps handful of white bud, or flowers, apparently in act of throwing. As background to arm appears part of dark conical (?) mass of black, covered with red and white flowers and poppy-like leaves in greenish grey ; and on extreme left is similar mass of black on which are scattered well-drawn leaves in grayish blue ; both are intended to represent trees. Background elsewhere vermilion, turning to pale buff between Buddha and disciples (paint probably lost); along top runs a black band. Buddha wears dark purple-brown robe, covering both shoulders ; outlined black and lined with buff, which shows at turnover on left shoulder. Head of Western, slightly Semitic type, with high straight forehead and somewhat domed top; large well-opened straight-set eyes, partially covered by eyelids ; nose aquiline; short upper lip ; small curved mouth ; softly rounded cheeks and chin ; ears are elongated and pierced, and there is small mustachea and rippling lock before ear ; eyebrows nearly meet over nose ; left strongly arched ; hair in curves along forehead, receding at temples; usnisa (Halo like representation of a goddess) partly lost ; all hair black. Flesh pale buff, flat on face, but with gray shading on arm ; contour lines rapidly drawn with broad brush in light red, and emphasized with lines of reddish-brown wherever a true outline is in question or strong outline of feature is required ; elsewhere (along sides of nose, line of jaw against neck and of forehead under hair, round ball of chin and for wrinkles in neck) the light red only is used, giving effect of rough shading but producing required effect at a slight distance. Eyes look slightly downwards under eyelid, and are painted like those of angels’ with white on eyeballs, brown on irises, and black for pupils and iris outline; behind head is circular halo of light buff bordered with red. The disciples are of a strongly Western type, with decidedly hooked noses and fuller and more prominent eyes. Their heads are of a shorter and rounder type, and the method of painting is different from that of the Buddha. 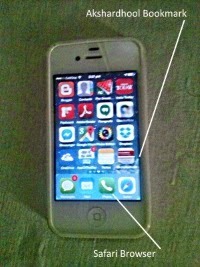 The colouring, however, is much stronger and cruder than that of the latter. All heads are shaven and are seen three fourth way to left; fig. on left in top row carries white cauri (A fan made from horse’s hairs) in right hand uplifted behind Buddha, and wears bright green robe lined with white, leaving right shoulder bare ; next wears bright red robe lined with white, covering both shoulders ; figure on left in lower row, light buff robe with folds indicated in red (right shoulder broken off); and figure at other end of row dark red robe covering both shoulders ; a hand of the latter appears at edge of fresco from inside of breast of robe, fingers clasping edge ; this figure also has two transverse wrinkles in forehead and heavy double-curved eyebrows meeting over nose ; ears are all pierced. The monotony of the heads is diversified by the difference of their gaze, some looking to their right, others straight before them, another more directly towards spectator and up under eyelids. The flesh itself is painted in clear salmon or flesh pink, shaded with warm grey, and with high pink blush upon each cheek ; all outlines are red-brown, and the shaven portions of the flesh are also represented in grey ; the lips are vermilion. The white impasto of the eyes is particularly thick, catching real high lights. The exhibits at the National Museum are absolutely fascinating. However I was equally impressed with the precision thoroughness and meticulous discipline with which Stein has recorded details of his finds. As I was searching for an image of the sphinx carved on one of the pillars of the Karle chaitya, perhaps by a Greek mechant of an ancient settlement named Dhenukakata near the famous cave, mentioned by Prof. D D Kosambi, I found one in one of your blogs on Greek mythical figures in the Buddhist shrines of western ghats. 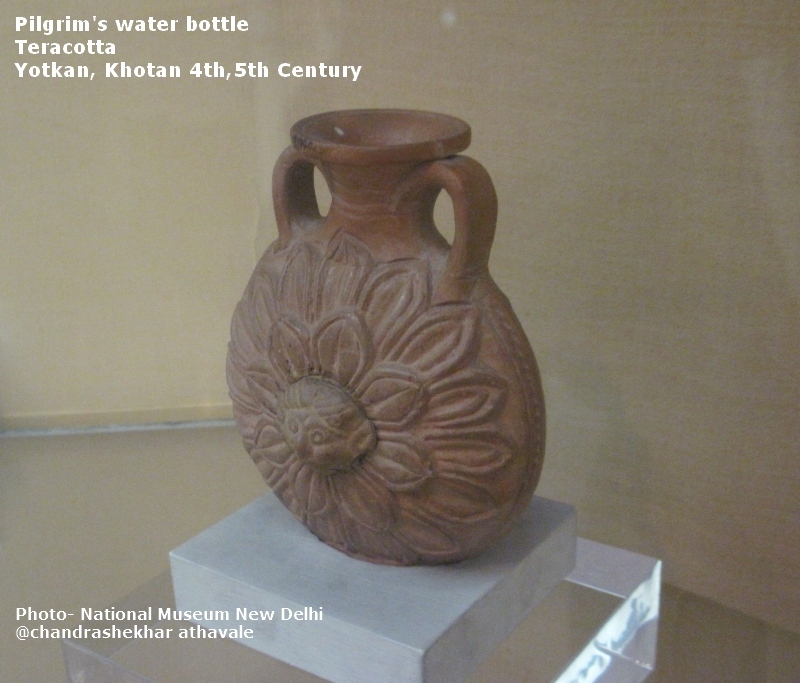 I pursued further and found your immensely interseting article :" Gems from the National Museum- New Delhi, Sir Aurel Stein Collection – Part 1". I was just fascinated reading between the lines. 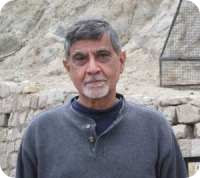 I'm from Kolkata and I will return to your blogs for further insights into the history of silk-road. Regards- Amitava Sengupta.